Check on iNautia.com all of the Used trimarans that we have. 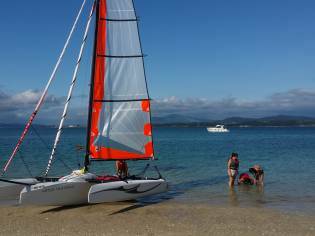 Find the Trimarans searching our website, we also have other types of boats available. 54 used trimarans for sale. Find your ideal trimaran boat, compare prices and more. Get an email alert for new ads matching your search. Buying a boat has never been so easy! Astus 16.5 Sport 5 m from Length. Trimarán 8 m from Length 0,3 m from Draft. Neel 45 13.5 m from Length. 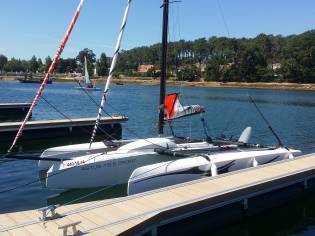 Multiplast Ultim Maxi 80 Trimaran 24.38 m from Length 4 m from Draft. The trimaran is a boat comprised of 3 separate helms, a larger one located in the centre that houses the cabin and two smaller ones, one on each side of the central hull, which keep the boat afloat. The first trimarans started to be used in south west Asia and Madagascar: the fishermen favoured this type of vessel for the stability offered by its central hull. In the late 20th century, they were used mainly for racing, offering an incredible performance but a little comfort. 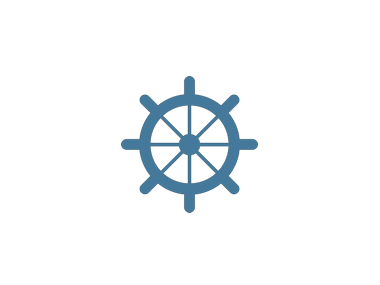 Since then, the multihull market has grown and nowadays it is possible to find boats designed for all types of sailing enthusiasts. Some shipyards in the trimaran sector offer boats with very large cabins that take advantage of the breadth of the hull, something which mono hulls can not provide. Despite the fact that they are not as popular as catamarans, trimarans offer the same stability and comfort and can be faster. Another advantage of trimarans is that they do not need the heavy ballasted keel, making it easier to take it out of the water or tow them.